"Snow Bunny's Christmas Gift" board book release! Hoorey! Today is the release of "Snow Bunny's Christmas Gift" Board Book! This is the second Snow Bunny story to be produced in this format. It's a smaller, more robust version for tiny hands to hold. The pages feature foiling just like the Picture Book edition so there are plenty of sparkles and twinkles to enjoy again. Great for a Christmas gift! The story is a warm, caring one about friendship. Snow Bunny shows her friends Fox, Mouse and Bear, how much she cares about them and delivers a special home-made present to each one of them just in time to enjoy playing outside in the Winter snow. It was lovely to create a Winter wonderland for Snow Bunny and her friends! I could paint lots of trees which I like doing and then cover them with snow. That's great fun! Then in contrast with the cold outdoors, I tried to paint their homes all warm and cosy on the inside. Thank you to Nosy Crow for publishing the book! It was a pleasure working with the team on these gentle Christmassy books! 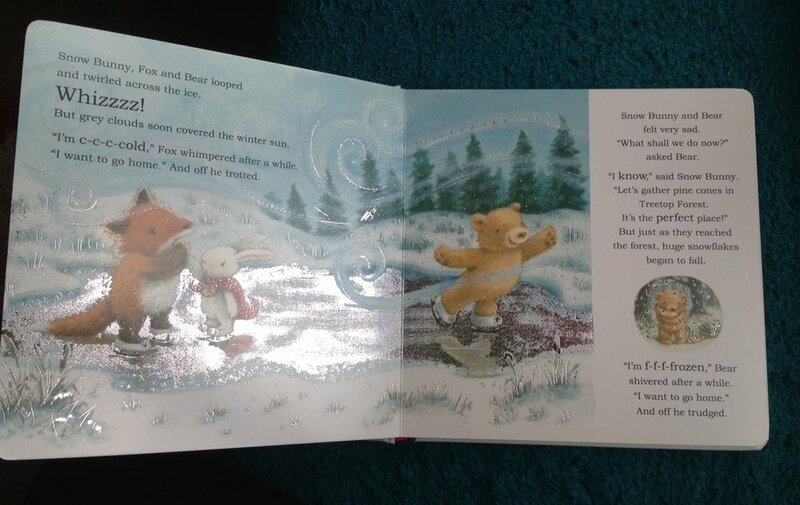 So far Little Snow Bunny has been read to children in Chinese, Finnish, French, German, Greek, Japanese, Korean and English in the UK and America! Wow! She is well travelled for a little bunny!